This D-Ring Fishing Rigging Bungee is boat accessory, suitable for ocean boats, canoes, rowboats and other boats, which is made of 304 hardness stainless steel, super strong and solid. Adopting polishing process, durable and wear resistance, no rust concern.For extra safety, we also match with a countersunk head cap screws. Simple design, easy to use. 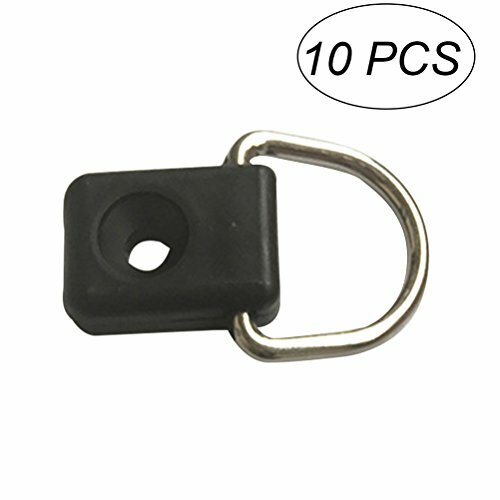 Allow quick connect and fix, this buckle is an ideal for inserting ropes or other items to fasten things. - Mading of 304 hardness stainless steel, strong and glossy. Adopt polishing process, durable and wear resistance, no rust concern. - Embedding the D-Ring fishing rigging bungee in plastic, no deformation or crack concern, super solid. For extra safety, we also match with a countersunk head hexagonal screw. - These D-Ring fishing rigging bungees are boat accessories, suitable for ocean boats, canoes, rowboats and other boats . Also fit for seats accessories. Simple design, easy to use. - The countersunk head hexagonal screw and embedded buckle make it safe and convenient. Allow quick connect and fix, is an ideal for inserting ropes or other items to fasten things. Mading of 304 hardness stainless steel, strong and glossy. Adopt polishing process, durable and wear resistance, no rust concern. Embedding the D-Ring fishing rigging bungee in plastic, no deformation or crack concern, super solid. For extra safety, we also match with a countersunk head cap screws. The D-Ring fishing rigging bungee are boat accessories, suitable for ocean boats, canoes, rowboats and other boats . Also fit for seats accessories. Simple design, easy to use. The countersunk head hexagonal screw and embedded buckle make it safe and convenient. Allow quick connect and fix, is an ideal for inserting ropes or other items to fasten things.